The present book, Humanistic Buddhism: A Blueprint for Life, is the clearest exposition yet of Humanistic Buddhism. It is Buddhism minus the regional, doctrinal, ritual, and traditional limitations that so often equate Buddhism with a particular ethnic or cultural group. It is Buddhism that seeks to improve the individual and society, the inner self and outer social environment. It discusses the physical body, emotions, morality and ethics, relationships with family and society, government, globalism, and nature and the environment: in brief, the human condition in its nature and the environment: in brief, the human condition in its entirety. Buddhism is often perceived as a religion that places an emphasis on the dark side of life: on death, dying; and suffering. Due to this perception, it is little wonder that the charge of pessimism has been leveled against it, perhaps more frequently than any other religion. It is a charge that often obliges apologists and scholars to provide cautionary statements disputing this viewpoint. Yet, it must be said that there is a modicum of truth to this perception, although not to the extent of reducing Buddhism to a one-dimensional stereotype. It is true that this attitude comes in part from within the Buddhist community, which often identifies Buddhist practice with funerals and Buddhist inquiry with the world beyond: the world of ghosts and demons. Is it any wonder, then, that Buddhism might be viewed as an impractical religion vis-a-vis the solution to life's problems? Furthermore, the pursuit of the "other-worldly" is fine for the scholar and religious professional, but does it meet the needs of the "man on the street"? More pressing to the latter are issues that affect the lives in the here and now, issues of right and wrong in all its manifestations. 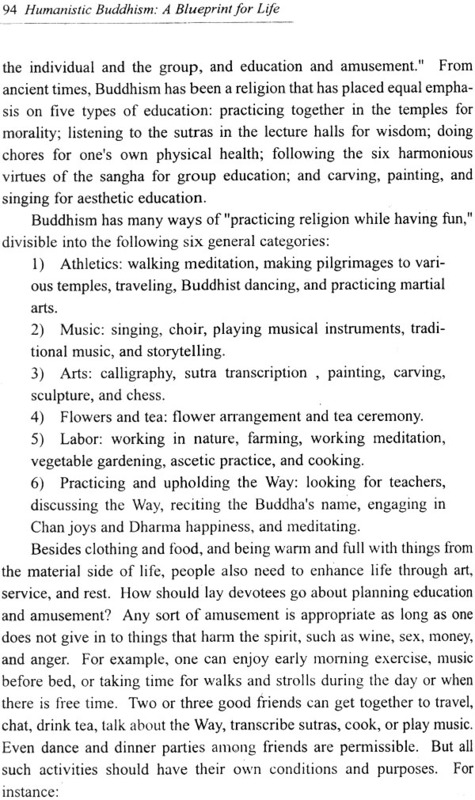 Certainly Buddhists are aware of the five virtues so prominently proclaimed in Buddhism and recognized and accepted as the basis of living the Buddhist life. To know these five, however, only in the most general and superficial manner and not to consider all the real life issues that arise from following one or more of these virtues, especially taking a life or stealing, is not very helpful to individuals who need to understand the consequences of avoiding or pursuing certain actions in the context of present day circumstances. The myriad issues that arise in the pursuit of living good and decent lives cannot be ignored. Buddhist teaching provides the foundation for judging what is right and wrong, proper and improper, beneficial and malevolent, but the decision cannot be based solely on theoretical and doctrinal pronouncements. Judgments must be reached through careful deliberations taking into account all of the consequences of the action. The move to a more practical, "this-worldly" Buddhism has been an on-going phenomenon over a number of decades. One of the early expressions of this more practical form of Buddhism in China was introduced by Venerable T'ai Hsu (Taixu: 1889-1947), the monastic who introduced the term "Humanistic Buddhism," a form of Buddhism that was designed to transform society and bring about human progress. Humanistic Buddhism is also the label used to describe the Fo Guang Shan Buddhist Order and monastery in Kaohsiung, Taiwan and the 200 plus temples and monasteries throughout the world. Despite the impression that Humanistic Buddhism is a recent innovation, the founder of the Fo Guang Shan Buddhist Order, Grand Master Hsing Yun has stressed on numerous occasions that it is not a later version of Buddhism, but rather, in the words of the Grand Master, "the Buddhism of the Buddha himself." 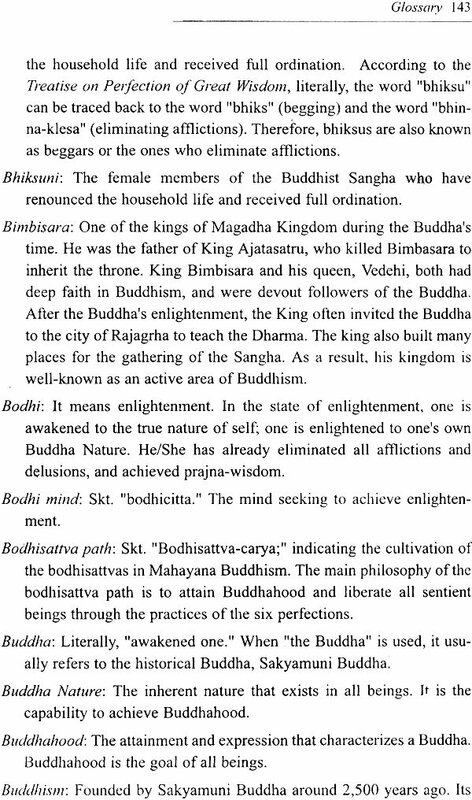 Furthermore, this Buddhism of the Buddha is understood to be the Mahayana tradition, specifically the bodhisattva path. This is what is meant by "practical Dharma." Very often, the "scriptures" of Buddhism leave the impression that the Buddha and his community were only interested in issues within the monastic community, on specific points of doctrine, and on the ultimate goal of Nirvana. 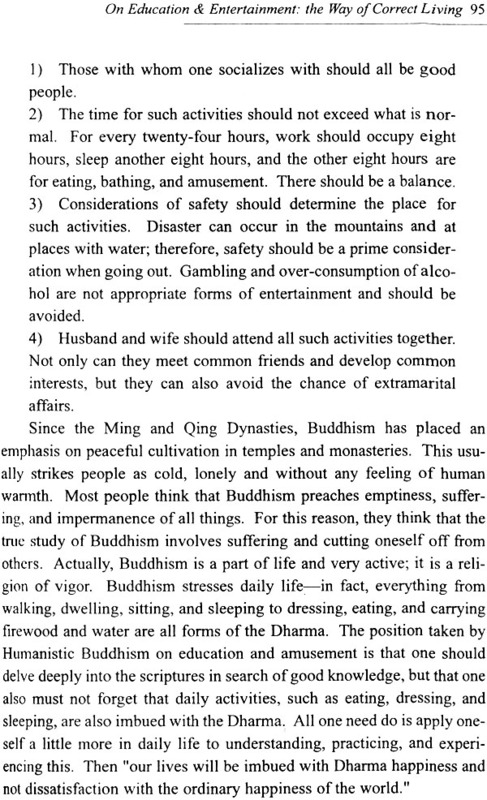 What is stressed here is the term "only," for there were other matters of concern: issues in politics, economics, and in pursuing the good life within the lay community, issues that were not exclusively associated with the Buddha's teaching but could nonetheless be illuminated by this teaching. 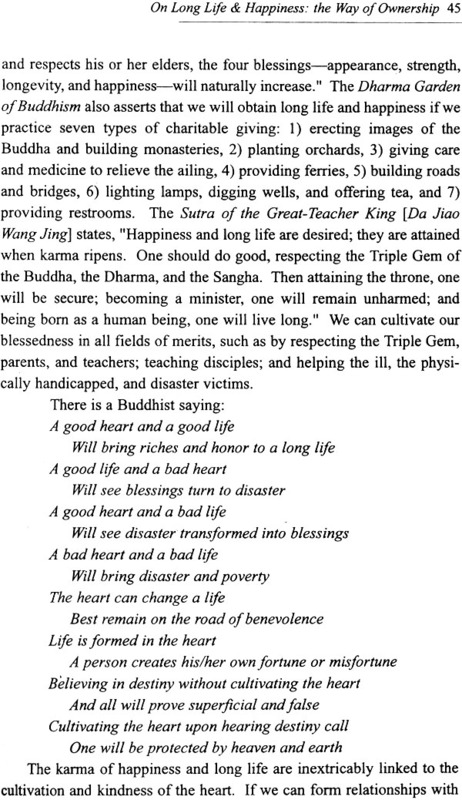 This renewed awareness that Buddhism is not only reserved for the elite but for all humans reflects Master Hsing Yun's ongoing commitment that the Buddha's teaching is "humanistic" because the Buddha was lived in the human realm and because all his teachings are there, but one need not assume nor achieve a special status to be transformed. It is revealing that Master Hsing Yun looks to Masters Taixu and Huineng as his predecessors or that both come from a tradition that finds no difference between the cycle of ignorant existence (samsara) and that of complete freedom of this cycle (nirvana). Liberation and transformation does not come about only after this life but might even be attained in this very life: an attainment for all, not only for "saints" but also for sinners. Venerable Master Hsing Yun has provided a valuable service to all Buddhists because he has reminded Buddhists that the true message of the Dharma is the practice of love, compassion, wisdom, and all the virtues that lead to these qualities. The present book, Humanistic Buddhism: A Blueprint for Life, is the clearest exposition yet of Humanistic Buddhism. It is Buddhism minus the regional, doctrinal, ritual, and traditional limitations that so often equate Buddhism with a particular ethnic or cultural group. It is a Buddhism that seeks to improve the individual and society, the inner self and the outer social environment. It discusses the physical body, emotions, morality and ethics, relationships with family and society, government, globalism, and nature and the environment: in brief, the human condition in its entirety. What lessons will be learned by the reader is the responsibility of the reader, but there can be no doubt that this book is a storehouse of wisdom that is readily accessible by one and all. Humanistic Buddhism, since its inception, has become widely established, spreading its roots throughout China, Taiwan, and many other places in the world. Even in Japan, although the term 'Humanistic Buddhism' is not used, in reality the thought and practice of Humanistic Buddhism is widespread. For example, Japanese temples are open to the public, monastics work in society, and a patronage system is in place. Buddhist communities in Japan have also founded universities and opened department stores. In Korea, Buddhist groups with long histories have gradually modernized and even established television stations. All of these events are indications that Humanistic Buddhism is the wave of the future. In addition to these trends, Mahayana Buddhism is already practiced in Vietnam, Malaysia, Indonesia, and the Philippines. Humanistic Buddhism is the bodhisattva path of Mahayana Buddhism. In some areas where the Theravada school is practiced, Hinayana Buddhism and the original form of Buddhism are still practiced as well. But recently, people with a vision for the future development of Buddhism in Sri Lanka, Thailand, and Myanmar are leaning toward Humanistic Buddhism. For example, Dharmakaya Temple in Thailand enjoys massive popular support. And, from the name of the temple, we can see that Thai Buddhists are actively on the way to the bodhisattva path. On February 6, 2001, Dhammananda, a nun from Thailand, publicly received the sramanera precepts at the Tapodaramaya Temple in Sri Lanka, thereby challenging long-standing traditions. Venerable Tep Vong of the Mahasangha in Kampuchea; Venerable Pandith Talalle Dharmaloka Anunayaka Thera, the senior monk of western Sri Lanka; Kumburugamawe Vajira Maha Thera, vice president of the Buddhist Pali University of Sri Lanka; Dr. Mapalagama Wipulasara Maha Thera, director of the Maha Bodhi Society of India; Bhiksu Ashwaghosh, editor-in- chief of the Dharmmakirti (Buddhist Monthly) in Nepal; Phra Maha Somchai Prohmsuwan, vice president of the Maha Chula Buddhist University in Thailand; and other virtuous and eminent monks joined together and attended the ceremony for transmitting the sramanera and sramanerika precepts, the bhiksu and bhiksuni precepts, and the bodhisattva precepts in India and undertook the task of serving as witnesses for ordinations. The International Buddhist Progress Society in Sri Lanka has published books on Humanistic Buddhism and also held a publication reception at Tapodarmaya Temple in Colombo, which was attended by more than three hundred monastics and devotees, including the likes of Venerable A. Sn Rahula, chairman of the Lohana group; the Vinaya scholar K. Nandaratana; Professor Daya Edirisinghe of the Philosophy Department of Kelaniya University; and Senarat Wijayasundara, vice chairman of the Sri Lanka Buddhist Association. These examples prove that the trumpet of Humanistic Buddhism has sounded and has been heard in all comers of the globe and is, undoubtedly, widely known. 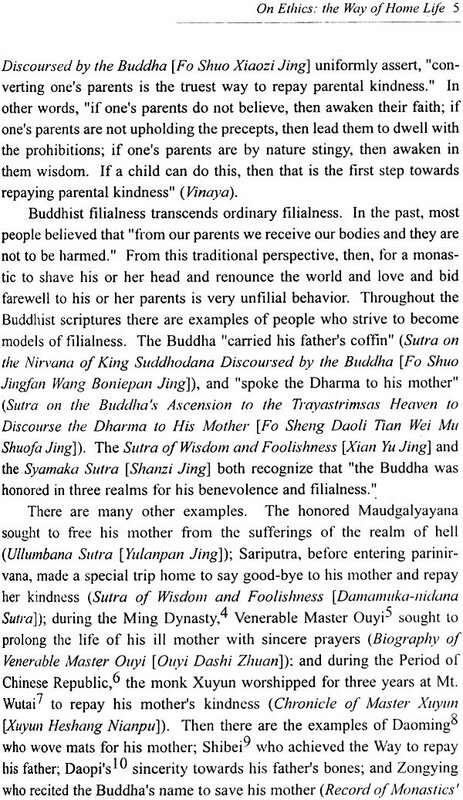 Humanistic Buddhism is not limited to a region or to certain people. It derives directly from the teachings of the Buddha; it is the religion of the Dharma bequeathed by the Buddha. Humanistic Buddhism is concerned with the enlightenment of humanity. If an individual or a group desires to be accepted, they must contribute politically or economically to society. By the same token, Buddhism will have value only to the extent to which it can conform to the times, providing people with joy and happiness. Otherwise it will die out. Buddhism is rich in resources, including literature, art, and music, all of which can be causes for the liberation of sentient beings. However, in the past, such resources were insufficiently utilized. Buddhism, instead, has emphasized an awareness of impermanence, non-self, suffering, and emptiness. It has never been humanistic or constructive, and for this reason it has never flourished. Over the last sixty years, I have promoted a Humanistic Buddhism that is part and parcel of life, not separate from it. Humanistic Buddhism is not the creation of Fo Guang Shan. The rationale for Humanistic Buddhism derives from the Buddha, the founder of Buddhism, because the Buddha was born, cultivated the path, became enlightened, and strived to enlighten others in this world. For the Buddha, it is this world that should take precedence. He lived among the people, and what he transmitted is Humanistic Buddhism. May all beings benefit from our blessings and friendship. help us to realize equality and patience. This gatha illustrates the bodhisattva way of Humanistic Buddhism. It is based on humanity with the family as its center. It possesses the non-discriminating universality of Avalokitesvara who, with great com- passion and loving kindness, selflessly helps all beings, putting the Dharma into practice in this world. 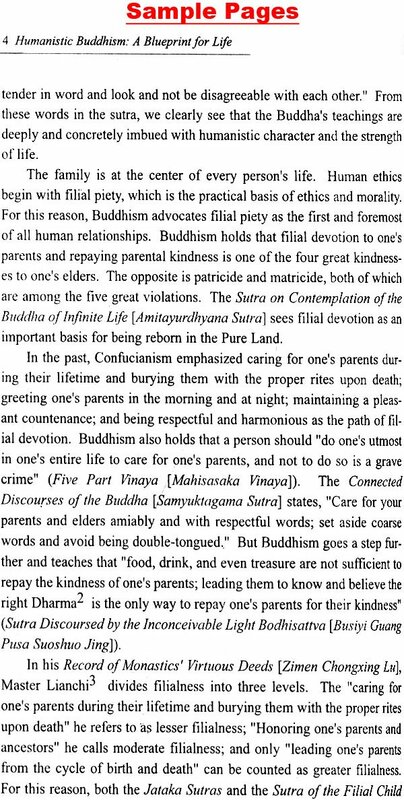 Humanistic Buddhism encompasses all these ideals. Humanistic Buddhism stresses the purification of life through ethical thought and the elevation of both mind and spirit. If you believe in the law of cause and effect and practice it in your life, then the law of cause and effect is Humanistic Buddhism. If you believe in compassion and practice it in your life, then compassion is Humanistic Buddhism. Taking refuge in the Triple Gem, the five precepts, the six perfections, and the ten wholesome conducts all are Humanistic Buddhism. Humanistic Buddhism is Buddhism that seeks to liberate all sentient beings. Without exception, all of the following constitute Humanistic Buddhism: writing books and developing theories; establishing and running schools; building temples and Dharma centers; discussing Chan over vegetarian meals; lecturing on the sutras and expounding the Dharma; cleaning streets and protecting the environment; engaging in educational and cultural activities; providing free medical care; caring for the elderly and educating the young; practicing the Dharma and transmitting the precepts; giving lectures on Buddhism; making pilgrimages to temples; reciting the Buddhas' names and practicing Dharma with others; giving Buddhist examinations; singing Buddhist songs and Chanting sutras; teaching the Dharma to the troops; carrying the teachings to the countryside; nurturing wisdom and skill; and upholding the precepts in life, as well as the relationship between oneself and others based on dependent origination, the cyclical law of cause and effect, the karma of good and bad, the successful extinction of suffering and the attainment of peace in this life, the world embracing everything with its nature of emptiness, and true self fulfillment. Humanistic Buddhism places more weight on reality than abstract discussion, on all sentient beings rather than the individual, on society rather than temples in the mountains and forests, and on benefiting others more than oneself. 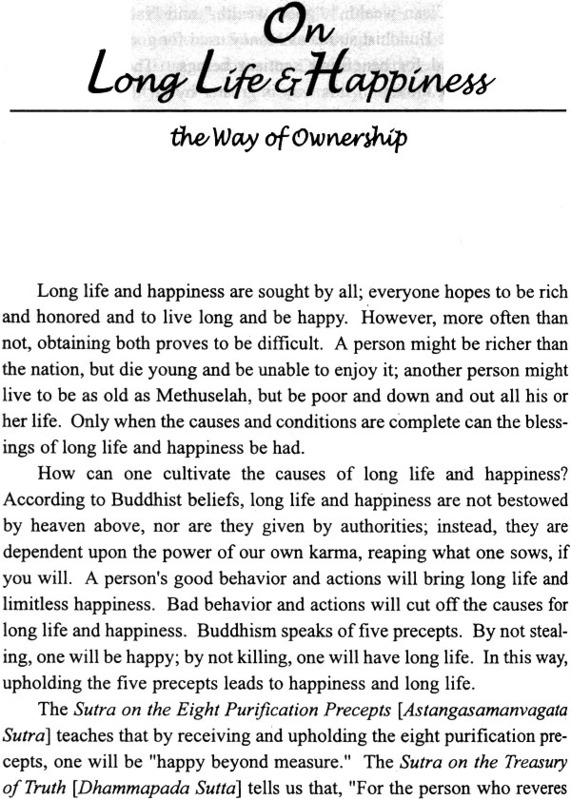 Humanistic Buddhism is any doctrine that increases happiness in life. The purpose of this book is not to discuss the theory of Humanistic Buddhism, nor to adhere to the conventions of a scholarly work, although it expresses sympathy for the sometimes hair-splitting, theoretical bickering and divisive ideas of some past scholars that unfortunately once split Buddhism apart. Actually, Buddhism, from the very beginning, has been "only one vehicle, not two or three." And its rationale as one that stems from a single faith is not in dispute. This also applies to the reading of the sutras. Their meaning is clear, but once we read the commentaries, we are often confused by the varied interpretations. The intention of scholarly Buddhist writing has been to provide people with confidence, understanding, consistency, and mastery through comprehensive study. Prajna wisdom is often mentioned in Buddhism for the purpose of erasing distinctions. But in the past, the various schools and sects of Buddhism argued about this, again and again, until they all had something different to say on the subject, Although it is said that Buddhism is vast and profound, all the various misinterpreted commentaries have not helped Buddhist practitioners to cultivate and attain enlightenment. Clearly, we do not like to argue about the Dharma. What we need is the single vehicle of Humanistic Buddhism to help us get to the heart of the matter. Humanistic Buddhism may be easy to understand but difficult to practice. In Buddhist circles today, there is no end to the teaching and discussion of the scriptures. But how difficult it is to expound on Humanistic Buddhism. Even if one can talk about it, it tends to be superficial and very difficult to put into practice. Humanistic Buddhism is the practical Dharma. In which aspect of life-walking, dwelling, sitting, lying down, eating, dressing, or thinking-can we depart from Humanistic Buddhism? It is my sincere hope that through these teachings I can help to pro- vide a blueprint for life and articulate the ideals of Humanistic Buddhism for all.